Although your procedure is planned meticulously and placement is conducted with clinical precision and a skilled hand, the dental implant itself is amazing in its simplicity and revolutionary in its application. 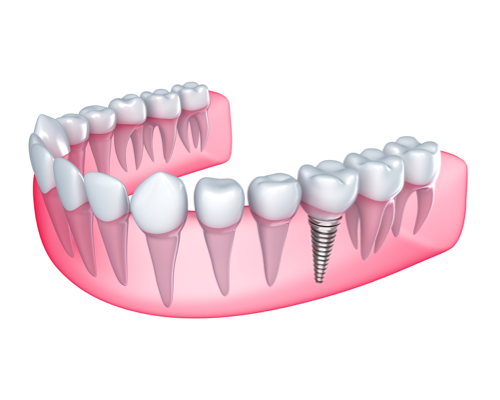 Dental implants are made from medical grade titanium and resemble a screw. What makes an implant such an ideal restorative solution is its ability to mimic the function of a natural tooth root and integrate with your jawbone in a relatively short timeframe, often only a few months. Once your implant is permanently fused to your bone, a replacement tooth or teeth are secured and your smile and health are restored. Although there are several options for replacing a missing tooth, a dental implant is generally the most ideal solution. Other treatment alternatives such as a bridge, which involves reshaping the adjacent teeth, or a partial denture, both rely on the surrounding teeth for support, whereas a dental implant is completely independent and secured into your jawbone, just like a natural tooth root. If another treatment method may better suit your personal circumstances, we will discuss these options with you so you can make an informed decision regarding how you would best like to restore your teeth to their optimal appearance and function. Our aim is to completely restore your teeth to your ideal requirements using the treatment techniques that are best for you. With routine check ups it is possible for your implant to last a lifetime. Following a thorough examination, a personalised treatment plan is developed, which will outline each phase of your treatment.